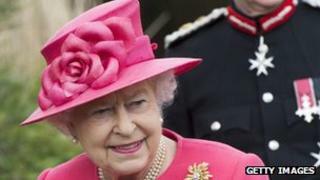 Monarchs from 26 countries are attending the Queen's Diamond Jubilee lunch at Windsor Castle, which is due to start at 12:30 BST on Friday. The private event will be followed by a dinner at Buckingham Palace, hosted by The Prince of Wales and the Duchess of Cornwall. Twelve members of the British Royal Family - including the Duke and Duchess of Cambridge, Prince Harry and the Duke of York - will also be there. HRH The Crown Prince of Yugoslavia and HRH The Crown Princess of Yugoslavia.